On July 20, 2014 we had sent the following "Shout Out" to Darjeeling's 1st Science Fiction writer - Ms. Penelope Fernandez. "TheDC team sends a warm “Shout Out” to Darjeeling’s daughter Ms. Penelope M. Fernandez and congratulates her on being the first Darjeeling born science-fiction novelist. 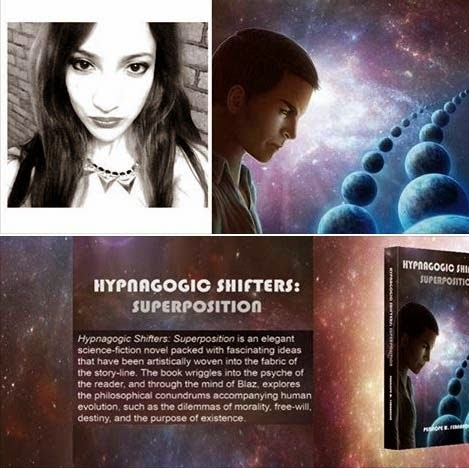 Ms. Penelope has recently completed the first part of her two part debut novel - “Hypnagogic Shifters: Superposition,” which is being applauded as a fresh and stand out work in Science-Philosophy genre of writings." Since then her book has been earning rave reviews... and has been selected for the Buzz Book Prize Writer Science Fiction award.. After passing the jury board, the competition now is open for voting to the public... Voting runs during the entire month of February and prize winners will be announced on March 5. Can we all please vote for our local girl and help her win her 1st award for her 1st novel? If you wanna congratulate her then you can drop in her page on facebook: https://www.facebook.com/hypnagogicshifters.